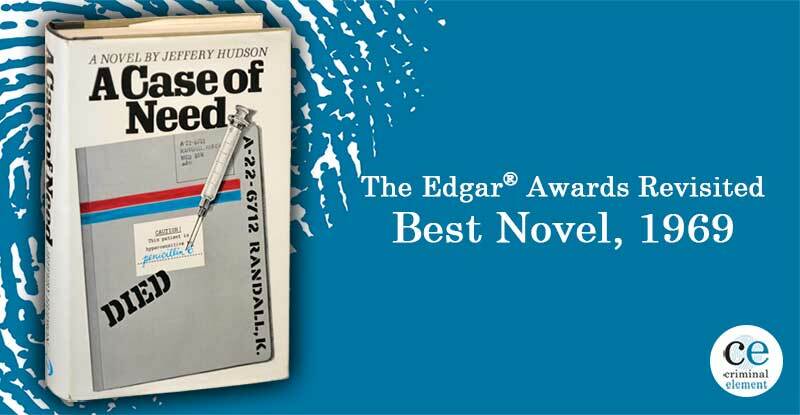 We're revisiting every Edgar Award winner for Best Novel. 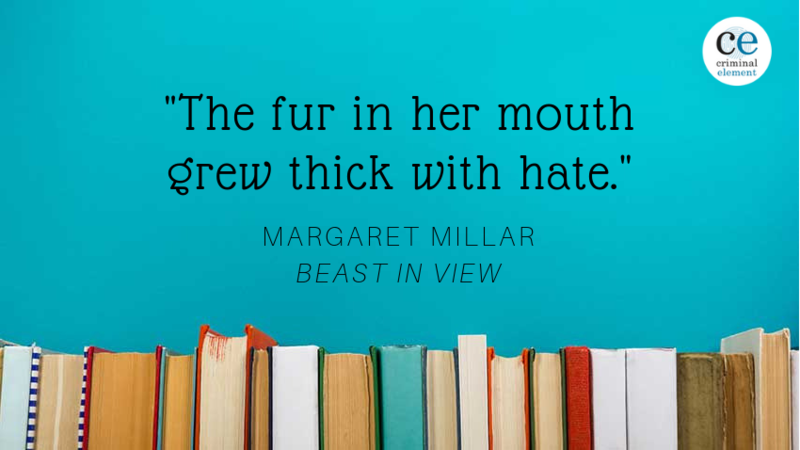 If you're searching for a book with that patented Plot Twist, check out 1956's winner, Beast in View by Margaret Millar. 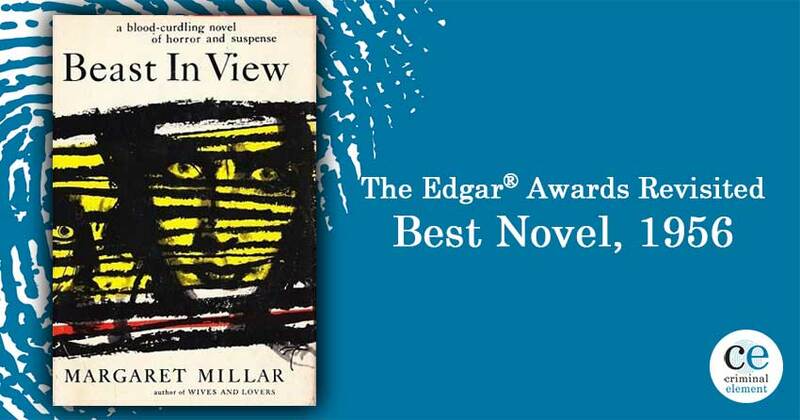 Beast in View by Margaret Millar won the Edgar Award for Best Novel in 1956. Helen Clarvoe is a 30-year-old shut-in. She lives alone and starts to feel that her life and fortune are threatened after receiving a frightening phone call. Helen recruits her family’s attorney, Paul Blackshear, to help her solve the mystery of the haunting messages. While he’s doubtful of the veracity of the calls at first, he’s forced to acknowledge something more sinister is going on when additional people start reporting similar calls, to devastating effect. At first glance, this basic building block of this plot seemed familiar to me — bringing to mind The Woman in the Window by A.J. Finn, one of the biggest thrillers of 2018. The protagonist of this book, Anna Fox, is agoraphobic — afraid to leave her house — so spends her time watching the world that exists outside of her window. When she witnesses a murder in the house across the street, her sanity is called into question by her neighbors. These two novels have similar centerpieces: A (rightfully) frightened woman, painted as paranoid by those who surround her, living alone. While I like the idea of this concept, I wasn’t all that taken by Finn’s spin on it, so I was excited to read Millar’s. I was hoping that Beast in View would avoid some of the problems I had with The Woman in the Window. (There was so much praise surrounding the book that my expectation was too high; I’m a bit tired of the I’m-an-unreliable-narrator-because-I-have-an-addiction device, and the ending plot twist was underwhelming.) The good news is, it mostly did! The book is old enough that I didn’t have too high of expectations coming in, only picking it up because of this Revisiting the Edgar’s series. I was happy to learn that it featured third-person narration, however, there were a few plot aspects of Beast in View that I didn’t love. They left me with mixed feelings about the book, but I’m definitely a new Margaret Millar fan. One more point on the Beast in View vs. The Woman in the Window matchup (that exists entirely and only in my head): Reviews of The Woman in the Window loved to throw the word “Hitchcockian” around — the main character is also a lover of his films. However, Beast in View was adapted for an episode of the Alfred Hitchcock Hour in 1964 with the actual Alfred Hitchcock, so Millar certainly wins that showdown. I believe that the strength of this book is in lies its characters and its prose. Millar’s characters were well drawn — the more horrible a person was, the more fleshed out and believable they were. You probably won’t very much like Helen’s mother, but you’ll immediately recognize her. Helen’s father is dead when the novel takes place; you encounter him in one flashback scene and he has one line of dialogue that tells you all you need to know about him as a father. Millar is good at drawing her characters from the sketches of awful people we can recognize from our own lives. She has their psychologies down pat. This mastery of bad people, though, causes a problem with Paul Blackshear, our lawyer-turned-detective. As a “good guy,” he was rather boring and his motivation was not very clear or compelling (that is to say, I didn’t feel his motivation). He doesn’t like or know Helen all that much at the beginning of the novel but decides to help her after meeting face-to-face because he feels sorry for her. Once he starts down the rabbit hole of the investigation, it feels more like his own curiosity is propelling it, rather than his concern for Helen. Suddenly, halfway through his once reluctant investigation, he somehow feels enough for Helen that he expresses to her that he’d like to help her live a better life. He wants to take her more places and suggests she buy better clothes (it’s super infantilizing). The development of all this feels very half-formed. He wasn’t really the character that I wanted to follow throughout this book, but after the big reveal, I can see why we had to. The prose was by far my favorite part of this book. The strength of it alone is pushing me to pick up another Margaret Millar book. As our mysterious caller walks down the street she finds that “the fur in her mouth grew thick with hate.” I MEAN, come on. You can just feel that — Millar illustrates the emotion of sitting in your anger and hatred of another person so well in that one line. There’s an observant wit that slides underneath her prose. It’s not too showy or distracting, just satisfyingly good. You know those lines that make you smile a little private smile at the narrator? That make you feel like the pair of you are sharing an inside joke? Beast in View was a satisfying read in this way. Let me make the only argument I need to make on this point by reproducing Millar’s opening lines — I wish I could include more of what comes after them, but it would be cheating to reproduce an entire page here. They’re the best opening lines I have read in a long time. You learn so many things from this brief dialogue! It sets the sinister tone for the novel. Miss Clarvoe is not afraid to tell a lie because she is prideful. She’s a loner. My feelings on Beast in View start to waver when I think about what it was “supposed” to do. Beast in View is classified as a psychological thriller. It has a plot twist, like most of them these days do, but isn’t a psychological thriller supposed to get your heart pumping? Beast in View didn’t do that for me. The “deeply creepy” atmosphere promised by the Megan Abbott quote that’s on the front cover of my particular edition of the book? I didn’t feel it. I also didn’t feel Helen’s fear, which supposedly is enough to spur the reluctant Paul Blackshear to investigate. Her response to the phone calls should have helped set the tone, but the phone calls she got just didn’t seem that bad or frightening. Weird, sure. But not scary. I could see on the page that she was frightened, but I didn’t feel it. However, that deep, deep sadness and self-loathing that we learn Helen possess? Oh, I felt that. The desire for self-punishment? Felt. That. We see through flashbacks that her parents were always constantly wishing that she was more — more outgoing, more charming, more good-looking, more intelligent. Millar captures Helen’s response to this so well; her desire to be someone else is the emotional core of the book. While I think there’s value in this, I was also kind of disappointed the book didn’t creep me out at all. Now, to turn to the plot and the ever important Plot Twist. This is where we get spoilery, for those who want to avoid that. The mysterious caller gives her name as an Evelyn Merrick. Though Helen originally tells Paul Blackshear that she has no idea who Evelyn, he quickly learns this is false. Evelyn and Helen were friends as younger girls, but their relationship fell apart years ago. Evelyn was prettier and more popular than Helen; Evelyn had many friends, while Helen really only had her. After already being rocky, the final blow to their friendship comes when Evelyn marries Helen’s brother. The marriage only lasts a few weeks; Evelyn and Dougie are divorced at the start of the novel. As the story progresses, Evelyn Merrick calls many more people than just Helen, her messages turning from threatening to outright venomous. She shares truths that rock her victims to the core — all of whom who are more interconnected than they appear to be at first. As Paul discovers these connections, the shared secrets cause problems for our cast of characters. Evelyn tells wives of their husbands’ affairs and the truth of her marriage to her ex-mother-in-law. The truth is devastating to all. Helen’s mother confronts her precious son, Dougie, after learning from Evelyn that he is gay (the reason for their divorce); he kills himself late that night. The man he was having a relationship with is later killed by Evelyn in the third act. As the fallout from Evelyn’s phone calls surrounds him, Paul discovers that Evelyn has multiple personality disorder. He hypothesizes that Evelyn (who had always been pleasant to the Clarvoe family when they crossed paths) is processing the divorce through a different, more vengeful personality. Of course, because he discovers this fact halfway through the book, it is a plot twist, but not the Plot Twist. People more intelligent and more qualified than me have written about this and will continue to write on this subject. As I was thinking about my feelings about this, I recalled (and was actually able to find!) a blog post I read ages ago. It was written by a multiple (as she calls herself) in light of the release of the 2016 M. Night Shyamalan movie SPLIT. It’s worth a read. I’m not looking to condemn this book on this representation alone, as I think the plot has other issues. It moves slowly at times, it’s not always clear exactly how Paul is making the investigative leaps he does, and I think the ending Plot Twist is relatively easy to guess once you realize the multiple personality revelation happens too early on to be the only reveal. To be fair, I’m not looking to condemn this book at all! I liked a lot of things about it, but the plot just didn’t do it for me. I loved Millar’s characters and prose so much I’m looking forward to reading more of her work. I’d recommend Beast in View to anyone, with the caveat that certain parts of it haven’t aged well. 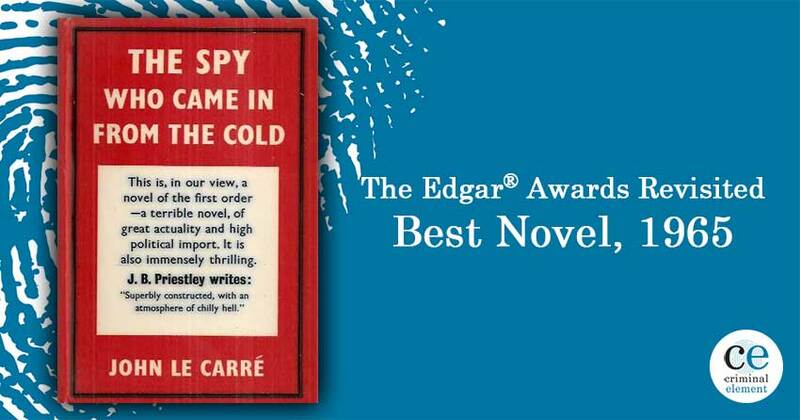 Philip MacDonald won the Edgar for Best Short Story for “Dream No More” from Ellery Queen Mystery Magazine. The Desperate Hours, starring Humphrey Bogart, won the award for Best Motion Picture. 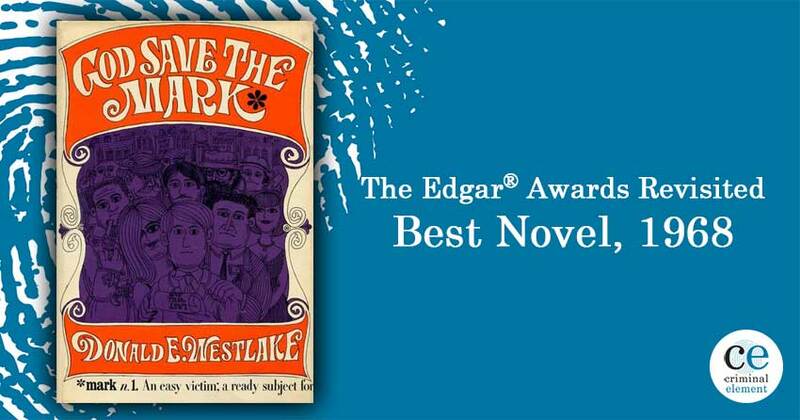 Scribner Publishers won a new Edgar Award called the Book Jacket Award. Best First Novel was awarded to Lane Kauffman for The Perfectionist. 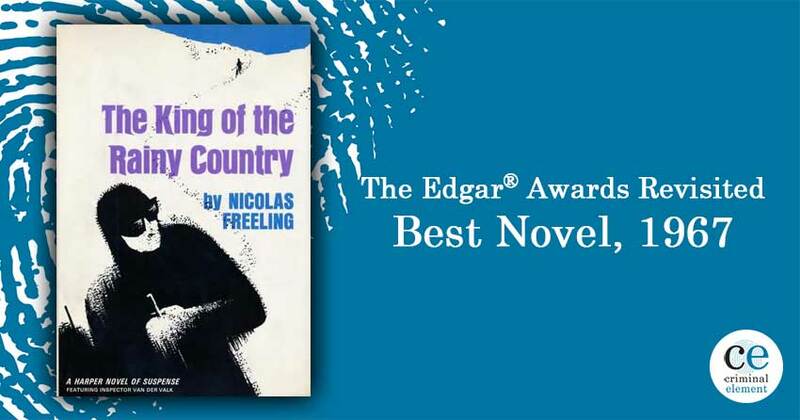 Patricia Highsmith’s The Talented Mr. Ripley was also nominated for Best Novel. Thanks again for joining us as we work our way through this list. Tune in next week when we discuss 1957’s A Dram of Poison by Charlotte Armstrong! Find it Friday.